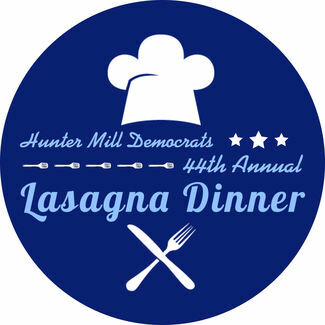 Hunter Mill Democrats: Lasagna Dinner FOOD BRINGERS!!!! So what's a delicious lasagna dinner without...ah you guessed it--lasagna!!! Our famous, fabulous Lasagna Dinner is also the greatest, most delicious potluck in Fairfax County. Calling all you superb chefs, you masters of marinara, bosses of bolognese, rulers of ricotta, principals of parmesan, and yes even you generals of the gluten-free, we need you all. And if your skills (or your shopping cart) take you towards the sweeter side of things, you are a vital part of what we do too. Please serve it up! We're going to have 200+ hungry Democrats, hungry for lasagna, hungry for salads, hungry for sides, hungry for victory in November! IMPORTANT--PLEASE BRING ALL FOOD BETWEEN 3PM AND 5PM to RCC Hunters Woods!!!! You can then go back home to change into your lasagna dinner finest and also get your checkbook for the auction :-).Please also bring a label for your dish so guests and kitchen volunteers know what is being served. If you need to drop off your dish prior to 3pm, please let us know at [email protected]. Note: All Lasagnas need to arrive COOKED! We'll heat them but they should need only to be warmed! If you have some serving utensils to go with this, all the better. We'll let you be the judge of this. ....I got nothing to add here. You know what to do.